Did you know that the #1 phobia is speaking in public? As a professional speaker, there is a lot you need to do, and remember on the day. It’s more than just creating a presentation… you then need to know it off by heart, plan your travel to the event, get ready to up-sell at the end of your presentation and have all of the equipment to deliver a professional speaking seminar. There is one thing that does tend to get overlooked in the professional speaking industry and that is the introduction. How many events have you spoken at, and not had an event organiser introduce you to an audience? This happens on a regular basis for a number of reasons. It could be because the organisers are busy with other things, or that it’s not a priority for them. I have been a professional speaker for over 8 years, and when I go to an event, I always look at ways I can be introduced to an audience because I understand the importance of this, and how it can build trust before I have even started my presentation. I had the pleasure of being a keynote speaker at the Social Media Conference and I was introduced by James, who is a Director at innov8. James had taken the time to research me and made sure the room knew a little something about me and then got me the biggest applause of the day… James I’ll promise to show you how to moonwalk nextime ;-). I am going to share with you 5 things you need to think about when it comes to introducing an expert speaker. Whether you are an event organiser reading this, or a professional speaker there will be a great deal of information you can take away from this article. Before you even step on stage to start your talk or presentation, you have to find a way to get the attention of your audience. If you are being introduced by an event organiser, or a colleague of yours, the first thing they should do is to get their attention by asking for it. Once you have got the audience’s attention, start by asking them a question. This will help them refocus, and get ready for your presentation. Ask a rhetorical question which they will agree with, so that you are starting off on the right foot with your audience. There is nothing worse than seeing someone introduce a speaker, when they don’t personally know them, or know what they are going to be talking about. You have to, as an expert speaker, build trust from the beginning and if the person introducing you isn’t coming from a honest place, and giving the audience a seal of approval, you audience will lose interest almost immediately. When introducing an expert speaker, you want the audience to be excited to watch and listen to their presentation so when you are introducing them, use language that will intrigue and excite the audience. Talking without notes is so important. If an event organiser is stood on the stage introducing you, and their head is in a piece of paper, rather than looking at the audience and addressing them directly, this will negatively impact the way the audience views you before you even say a word on stage. As someone who has spoken at hundreds of events, I will always reach out to the event organisers that I have a personal relationship with, and share with them the way I would like to be introduced. Sometimes, it doesn’t work out and you do have to get on stage without an introduction and if this does happen, make sure you are prepared and can introduce yourself in a way that will grab your audience’s attention. 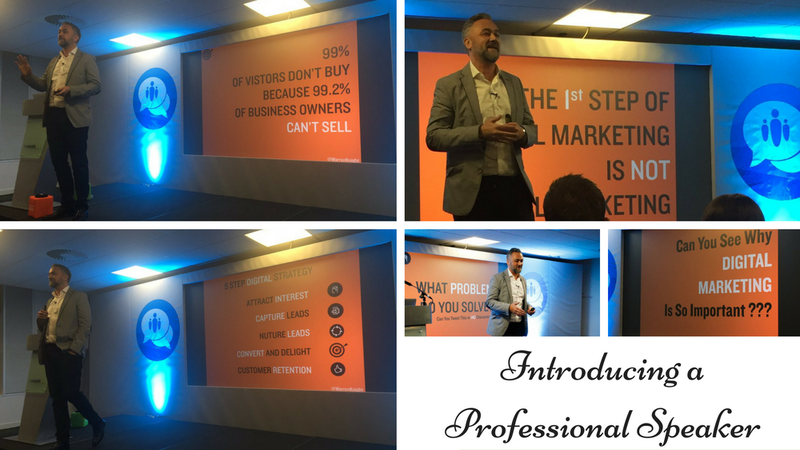 If you are a professional speaker, or event/trade show organiser, I would love to hear about your experience with introducing a speaker, or being introduced as a speaker. Excellent advice. Do you run workshops on public speaking and media training?